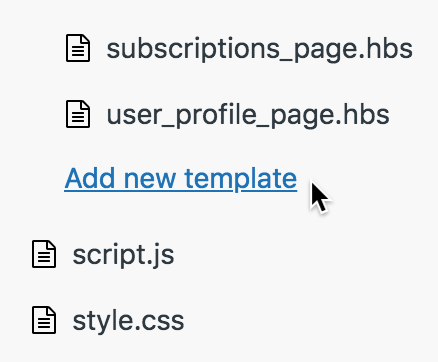 Note: On Guide Professional, you can access this feature and create multiple templates in a non-live theme, to try it out. You cannot create multiple templates in your live theme. 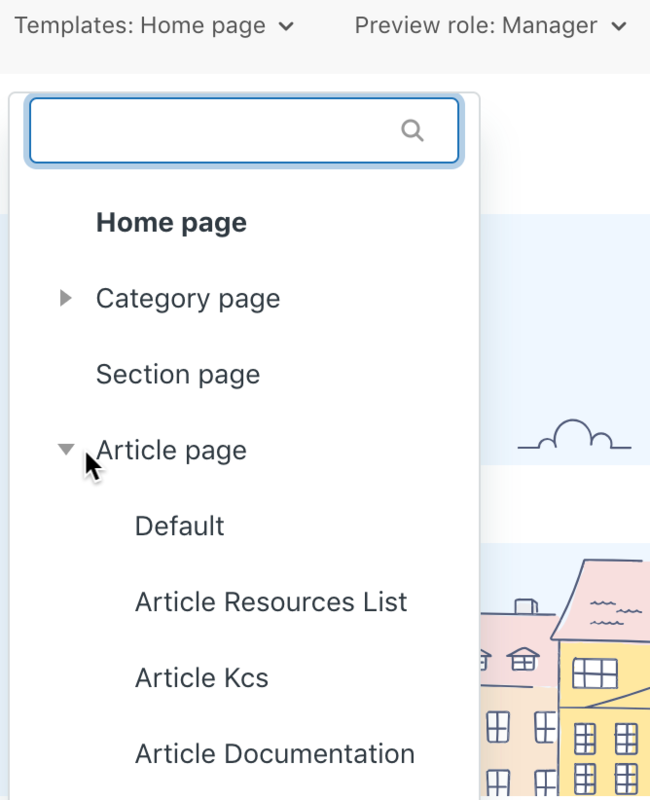 In a Guide theme, there is one page template each for article, section, and category by default. You can create up to ten additional page templates each for articles, sections, and categories. This means that you can create alternate versions of templates to use for your articles, sections, and categories. You can change the look and feel based on content. You can apply or change the page template when you create or edit an article, section, or category. You cannot create additional templates for any other page type in your theme. You must have Guide Enterprise and you must be a Guide Manager to create multiple templates. You can create additional page templates for articles, sections, and categories using the theme editor in Guide. If you prefer working on your themes locally, you can also add templates to your exported themes. In Guide, click the Customize design icon ( ) in the sidebar. Your themes appear on the Themes page. Hover your mouse over the theme you want to edit, then click View theme. Scroll to the bottom of your templates list, then click Add new template. 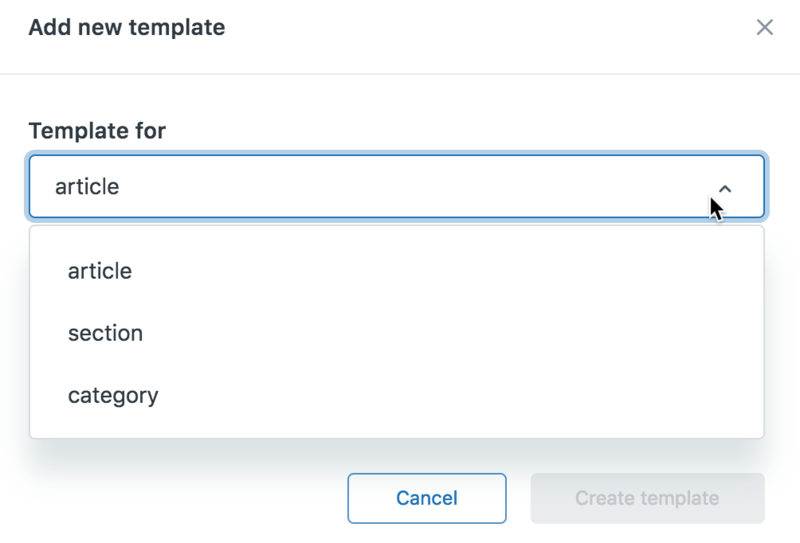 Under Template for, select the type of template you'd like to create. You can create article, section, and category templates only. You can create up ten additional templates for each type. Under Start from, select an existing template to copy and use as a starting point. You can select blank template if you don't want to start from another template. The new template opens for you. Edit your template and click Save as you go. To preview your template, click Preview, then click Templates at the top of the preview and select the template you want to preview. For more information, see Previewing your theme while editing theme code. When you are ready, you can apply your template to a new article or new category or section. You can also change the template on an existing article, section, or category. If you export and work on themes locally, you can add multiple templates to the themes. 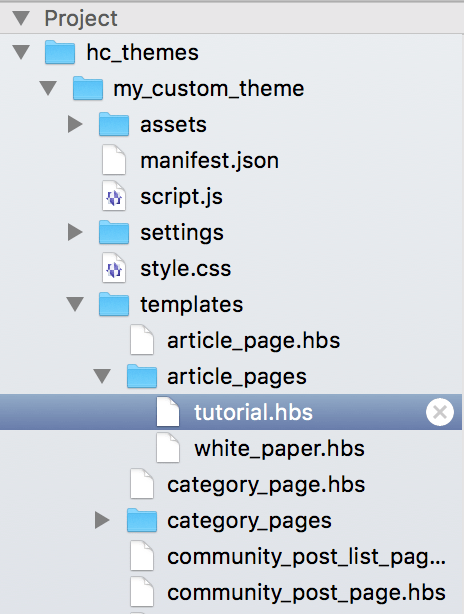 The workflow consists of creating a predefined folder in a theme's templates folder, then adding .hbs template files to the folder. To learn more about working on themes locally, see Working on a theme locally. As in the Guide theme editor, you can only create article, section, and category templates. Add an .hbs template file in the new folder. You can name the file anything you want. The name must be 25 characters or less, and snake_case. Tip: To save time, copy an existing .hbs file into the folder to use as a starting point for the new template. Edit and save the template. If you need to add more templates of the same type, add them to the same folder. When you're done, zip the theme and import it into Guide. Use Guide to preview the new template. We'd like to have a default set of headings/sections populate when a new article is created. Is there a way to do this with templates? It doen't look like I can define a default "article body" to populate that would then be editable. Thanks in advance for any tips. Hey Nick, It sounds like you are looking for some information on how to set up consistent Articles in the Article Editor itself, not the back end behavior of these articles. Unfortunately we do not have built in functionality that accomplishes exactly what you're looking for, Article Body Templates. That is a great suggestion though! For now I would recommend drafting your articles bodies in a service like Microsoft Word or Google Docs and then copy past in as needed. It's not seamless, but it will cut down on your editing time. Makes sense. Thanks for the info. Just wanted to echo this request too - that would be of great use to us. I was just asking a member of your support team the very same thing. Surely it wouldn't be that taxing to do in the backend and make the feature available to us no?